Boating enthusiasts helped to set a new world record for the most life jackets worn during the fourth annual “Ready, Set, Wear It!” campaign. On May 18, people from various organizations and clubs put on personal flotation devices (PFDs) in an effort to break last year’s “Ready, Set, Wear It!” Life Jacket World Record Day record of 3,993. That record was shattered as nearly 200 events around the world were held, bringing a total of 5,774 people donning PFDs. From California to Canada and Australia to Japan, participants helped beat the 2012 record. In Newport Beach, the Balboa Sail and Power Squadron did its part by organizing several “Ready, Set, Wear It!” events throughout the city. Boat owners, sea scouts and others participated in the event, which is part of the North American Safe Boating Campaign to promote safe and responsible boating. 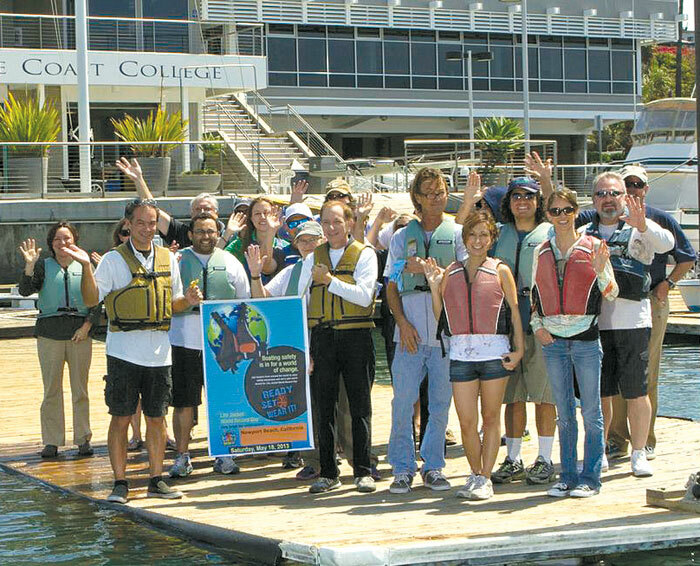 A total of 73 boating enthusiasts from Orange Coast College School of Sailing and Seamanship, American Legion Yacht Club, the Sea Scout Base, Newport Dunes Resort and Marina, and the Balboa Sail and Power Squadron donned inflatable life jackets at the coordinated events. Volunteer organizations and groups registered their “Ready, Set, Wear It!” events on the National Safe Boating Council website to participate in the annual record setting day. More information can be found at readysetwearit.com.